This peptide-rich serum uses stem cell technology to nourish scalp and follicle, creating the perfect environment for strong, healthy growth. Infused powerful Keratin Amino Complex™ which bonds to hair’s natural keratin protein, it delivers deep nourishment to thicken and fortify thinning hair, rebuilding and rejuvenating each shaft. Regular use of this light, leave-in formula helps reconstruct and strengthen hair’s protective outer layer, repair split ends and increase fullness, shine and resiliency. Weightless, alcohol-free and fast-absorbing; use daily to increase the look of thickness and volume over time. After towel drying hair, apply directly to the scalp and massage with fingertips. 2 fl. oz. Towel dry hair. Apply Serum directly to the scalp and massage with fingertips. Do not rinse. Do not use in combination with Keranique® Hair Regrowth Treatment or other products containing Minoxidil. 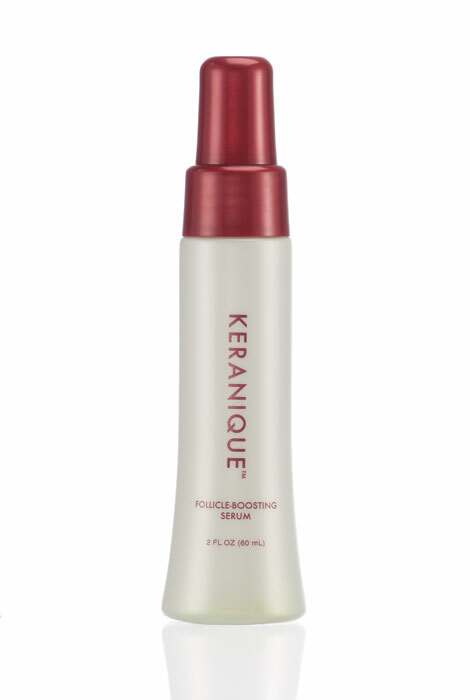 For even thicker, fuller hair, use Keranique Volumizing Lifting Spray during styling. No bad comments. I believe that this follicle booster (used with the other products) is the key to growing new hair. I lightly spray on freshly washed hair while still wet and lightly massage into scalp. Just trying something different for thinning hair. I have never used this product, I am having trouble with my hair thinning and coming out by the hand full. Heard that this serum works. used the other products before and was very good. I hope this thickens my hair. I hear great review about this product. Since I'm experiencing some thinning with my hair I decided to try the product. my hair is so thin, willing to try anything. The good reviews and that minoxidil does stimulate hair regrowth. I have super fine hair and am hoping it will help fill it back in to what it was. Looking for help with fine & thinning hair. Thickening and fortiffying my hair. I have heard about Keranique but have never tried it. great product that actually does what it says! I notice my hair was coming back where it was thinning in thee top. my hair is getting very thin. I hope this will help. Have used before and like results. Will it work on relaxed hair? BEST ANSWER: Didn't seem to do much for my permed hair. I haven't been impressed about Keranique in general. I think hair vitamins work better. If you mean by relaxed hair, soft hair I would agree that it helps, even give it some body and ability to style the hair. I'm sorry - I don't know what relaxed hair is. I have thinning hair and it has added volume & strength to my hair. Can I use the lift & repair treatment with the follicle boosting serum? BEST ANSWER: Thank you for your question. Yes, you can use both products together. We hope this information will be of help to you. I use a straightening comb on my hair as well as a flat iron, and do not wash my hair daily. Can i use serum on dry hair and press? Can I press or use heat after applying on dry hair? BEST ANSWER: Yes. I use my flat iron on low heat. can this be used with Minoxidil? BEST ANSWER: No! The packaging clearly states that this product cannot be used in tandem with Minoxidil or Rogaine! BEST ANSWER: Thank you for your question. The directions for the Keranique Follicle Boosting Serum are: Towel dry hair. Apply Serum directly to the scalp and massage with fingertips. Do not rinse. We hope this information will be of help to you. Do you have to wash your hair daily before applying this product? BEST ANSWER: Thank you for your question. Yes, your hair should be washed before using this product. We hope this information will be of help to you.